The features begin rolling out and testing today for some users. Together, these changes should make Facebook more visually stimulating and addicting. As other networks like Twitter introduce auto-play video like Facebook did, and Snapchat adds animated selfie lenses and its own profile GIFs, Facebook has to stay a step ahead in the graphic arms race. Meanwhile, Facebook wants to cement its profile as the center of your web presence. Snapchat hardly has a profile, and Twitter’s is basically just your most recent tweets. If Facebook can do more to let you customize how you represent yourself, you might be more willing to link back and send traffic to your profile. Facebook’s product manager on the new profile, Aigerim Shorman, tells me it’s designed to highlight “what’s going on in their life, what’s important to them now in more expressive ways.” The most recent post you shared probably isn’t as useful for grasping your identity as biographical info or photos of you, so Facebook’s pushing that stuff above the timeline. And finally, putting biographical info more front and center could get people to keep this information more up to date, which is critical to powering Facebook’s advertising engine. A similar overhaul of the web profile in 2010 scored Facebook immense amounts of data on where people live, where they went to school, and where they work, which has fueled its ad targeting ever since. Soon you’ll be able to click on your profile pic to upload a new profile video. You tap the record button and can shoot for up to 7 seconds with sound. The looping video will auto-play without sound (unless clicked) on your profile and the feed story about you uploading it. A still cover image you select will appear everywhere else, such as the small thumbnail that appears next to your News Feed stories. “Earlier this half [year] we were having a brainstorm, and sometimes you find a gem,” Shorman tells me. “One of my designers called me over [to look at an engineer’s] Facebook At Work account. But his profile pic was moving. I thought ‘this is going to be a great expression opportunity.’ It brought the profile to life. You got to know the person better. So we got inspired to create an option to create a profile video.” She insists the Snapchat Profile GIFs that launched in July weren’t even discussed in the feature’s creation. In the examples, you’ll see Facebook employees dropping hats onto their heads, blowing their faces with air, or cracking a slow but subtle smile. The profile videos feel a bit like the Harry Potter newspapers, where photos suddenly come alive. They’re sure to unlock a ton of creativity from the user base. The next biggest feature is a new option to select up to five Featured Photos that will appear pinned to a section at the top of your profile. This is designed to let you give people considering your friend request or who just met you a better clue to your identity. They could show your favorite after-work activities, your pets, or just some extra selfies. Think of them as the extra photos in your Tinder profile. They’re not your main profile pic, but they’ll be used to judge you. The temporary profile pic feature I spotted Facebook testing a few weeks ago is now getting an official rollout. It lets you select a profile pic, but have yours revert to your old pic after a set number of hours, days, or weeks. It’s useful for promoting a cause, like the 26 million people who set their profile pic rainbow in support of the right to gay marriage. In some cases, Facebook even provides little tools for filtering your profile pic. Facebook is now adding in-line privacy controls to the big About information fields that appear at the top of your profile. Those set to public will now appear immediately on the profile below your profile pic, rather than buried in the About section. You’ll also be able to describe yourself in words with a new 100-character Bio field, which could also help people figure out if they want to be your friend, as long as you keep that section public. Rather than just port the more left-aligned web profile to mobile, Facebook has built a mobile-first design. It makes the profile pic/video bigger and puts it in the center of the screen. 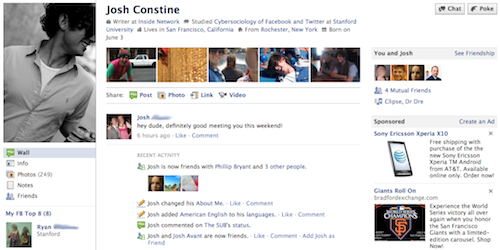 Below, rather than small panels that open to reveal details on friends and photos, Facebook is giving both their own big sections pinned below the profile pic and above the timeline. At first glance, the changes might seem merely aesthetically pleasing. And truthfully, that was the only task of the team that designed them. But the repercussions for Facebook’s business could be significant, just like a similar overhaul of web profiles in 2010 was. It’s another smart way Facebook has managed to align its business with its user experience. People go to your profile to get to know you. News articles or weekend tales aren’t as illustrative as a profile video, featured photos, or Bio text. Pushing them to the top gives your friends, and advertisers, a better understanding of who you are.